While the reconstruction of transcripts from a sample of RNA-Seq data is a computationally expensive and complicated task, the detection of splicing events from RNA-Seq data and a gene annotation is computationally feasible. 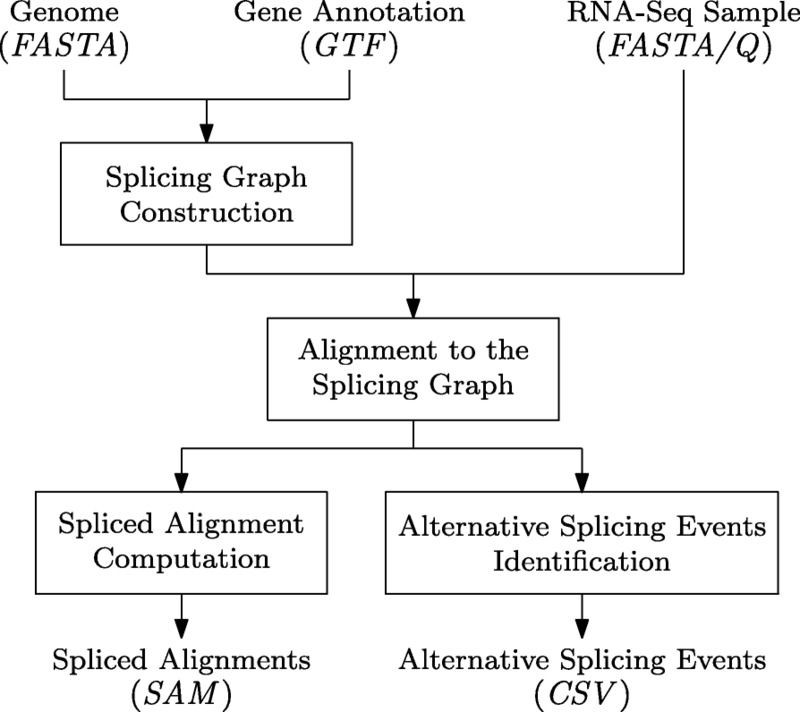 This latter task, which is adequate for many transcriptome analyses, is usually achieved by aligning the reads to a reference genome, followed by comparing the alignments with a gene annotation, often implicitly represented by a graph: the splicing graph. Researchers from the University of Milano present ASGAL (Alternative Splicing Graph ALigner): a tool for mapping RNA-Seq data to the splicing graph, with the specific goal of detecting novel splicing events, involving either annotated or unannotated splice sites. ASGAL takes as input the annotated transcripts of a gene and a RNA-Seq sample, and computes (1) the spliced alignments of each read in input, and (2) a list of novel events with respect to the gene annotation. An experimental analysis shows that ASGAL allows to enrich the annotation with novel alternative splicing events even when genes in an experiment express at most one isoform. Compared with other tools which use the spliced alignment of reads against a reference genome for differential analysis, ASGAL better predicts events that use splice sites which are novel with respect to a splicing graph, showing a higher accuracy. ASGAL is the first tool that detects novel alternative splicing events by directly aligning reads to a splicing graph. Availability – Source code, documentation, and data are available for download at http://asgal.algolab.eu.